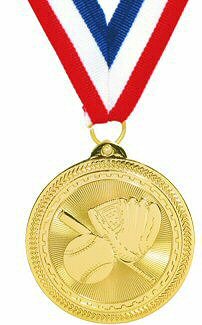 New baseball medal that has a super bright shiny face, the look of a brand new minted coin. Black brass plate on the back allow your personalized message to stand out for only 50 cents more. Available in gold, silver and bronze finishes, the medal also comes with a free 7/8 x 30 inch v-sewn neck ribbon or pin drape.